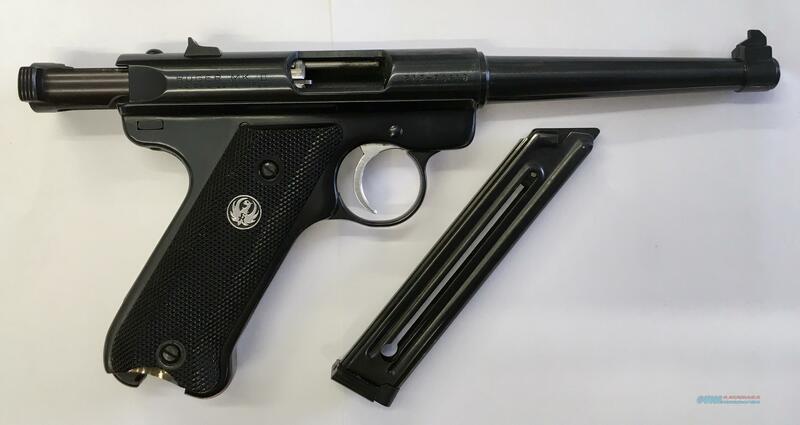 Description: Very good condition Ruger Mark II 22lr semi-automatic pistol with one 10rnd mag. No box or papers. Very slight wear please see photos. Bore is sharp and shiney. Please feel free to ask any questions. PAYMENT: Due within 5 days of auctions end no exceptions. ** Payment methods are: Credit Cards: Master Card/Visa/American Express/Dinners Club which all have a 3% fee or US Postal Money Order. No Personal or Certified Checks of any kind. If you win the bid there is no backing out. In store pick-ups must be approved first. It is the buyer’s responsibility to ensure that the weapon is LEGAL to own in your city/state. *** No refunds are given if the weapon is not transferable. *** No sales to CALIFORNIA. **** Shipping & Handling for this item is $35 within lower 48 states. Insurance is optional and is $1.50 per hundred. If you choose not to insure your item then you take the risk, not us. Not for Sale where prohibited by law. *** Firearms shipped to FFL dealers only. We will ship upon receipt of payment and signed legible copy of dealer’s FFL via fax, mail or e-mail. North Carolina residents add 6.75% sales tax. We operate a full time gun shop which means that every auction item is for sale in our store. We make every effort to pull an item after it receives a qualifying bid. On rare occasion an auction item may be sold in the store before we notice your bid and if that happens we will notify you immediately. On new firearms we may use file photos instead of the actual gun. Feedback will be posted upon your posting feedback for us. **** Email me with any questions before bidding as we DO NOT retract bids! Email .